Diwali comes from the Sanskrit word Deepavali which literally means "a row of lights." This auspicious day, known as the "festival of lights," is celebrated by Hindus around the world. It historically symbolizes the victory of good over evil and celebrates light and life on both community and personal levels. While Diwali is popularly known as the "festival of lights", the most significant spiritual meaning is "the awareness of the inner light". The celebration of Diwali as the "victory of good over evil", refers to the light of higher knowledge dispelling all ignorance, the ignorance that masks one's true nature, not as the body, but as the unchanging, infinite, immanent and transcendent reality. With this awakening comes compassion and the awareness of the oneness of all things (higher knowledge). Just as we celebrate the birth of our physical being, Diwali is the celebration of this Inner Light. Due to an important personal engagement which requires my 100% attention, I am unable to publish new blog posts for the remainder of this week and the next week. I will return with some exciting posts from the week that starts on 6th October, 2014. Until then, please feel free to browse through these articles I have already posted and share your thoughts. I would love to know what you think on them. Being a Toastmaster, I am always fascinated by great speakers and great speeches. I like to learn from those men and women and improve my own speaking. Last year, I shared a few of my thoughts about the famous “I Have A Dream” speech by Martin Luther King Jr. You might want to check that out by clicking here. Along the way, I have come across many impactful speeches throughout history and I have always enjoyed perusing those words that ring through time. My thanks go out to my awesome friend, Distinguished Toastmaster Alan Balthrop, who loaned me a book of about 50 most famous speeches from around the world. Among those 50 famous speeches, I found this great speech by Mahatma Gandhi. It was delivered in a packed courtroom to about 200+ people on March 18, 1922. Just because Aweber is popular, it is not necessarily the best email marketing service out there. After being a loyal customer for over 3 years, I finally decided to change my service provider. The reason I signed up with Aweber is not that I knew a lot about email marketing. It wasn’t because I knew a whole lot about different companies either. I chose Aweber for my email marketing needs because it was the service so many online marketers were using and recommending. People told me that Aweber was the “gold standard” in email marketing. And it worked. I was impressed and convinced! Some of the most successful bloggers started blogging as a hobby. Some of them wanted to document an important phase of their lives. Others wanted to share adventures from travel to business to major life events. Many started simply to teach others. The point is that most successful bloggers didn’t get into blogging for money. It’s hard to believe that some multi-million dollar revenue blogs started out as small side projects. It doesn’t happen overnight. I have interviewed many very successful bloggers and several of them shared that the first couple of years were a lot of work with little reward. Their sites have received few visitors if any during the first few months, but they kept writing and churning out content. 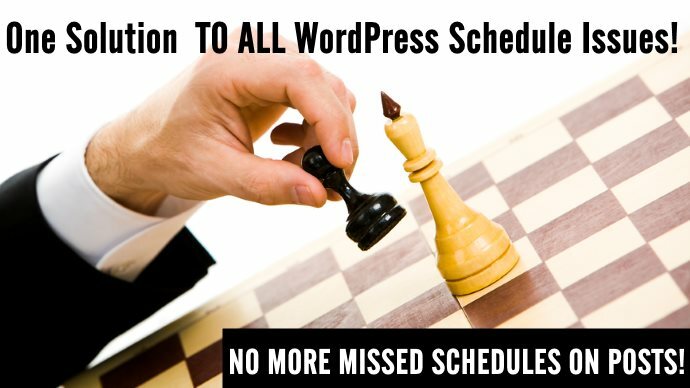 Have your scheduled posts ever missed their schedules in WordPress? Did you find a solution to the problem? How did you fix it (if you fixed)? One of the issues people say they started to notice was the missed schedule errors since WordPress version 3.5. A lot of people have experienced this error after they implemented W3 Total Cache plugin. Digging further, some people say the problem arises when Database Caching or Object Caching is enabled in W3 Total Cache plugin. There are many different opinions about it. However, it’s not clear if W3 Total Cache will ever be able to fix this problem. When it comes to blog commenting, there is always a debate as to which commenting system is the best and which one should you use. Well, the grass is always greener on the other side and I see that true in blogging arena too. People who have default WordPress commenting system, they wonder if they should switch to CommentLuv or should they choose DISQUS? People who have one of these commenting systems, they seem to wonder if the other one is better. We had a wonderful guest blog post by none other than Adrienne Smith just a few days ago about CommentLuv, it’s components and some incredible features of the tool and. I am not such a huge fan of having too many plugins on a WordPress installation. However, there are times I can’t avoid adding a plugin or two for a feature that gets my attention! At other times, I come across some awesome plugins because my clients need them. I am not suggesting that you install all of the plugins I suggest. However, if you need a feature that one of these WordPress plugins offer, these are definitely a great choice! I am not going to write a whole lot about these WordPress plugins because their functionalities are so intuitive, and they are so lightweight, that you don’t need to go through too many hoops to get them working for you. When was the last time you analyzed your blog traffic to identify your most popular blog posts? How many of those posts are from last year or the year before last? It’s not just about Google. The real readers of your blog, the humans also tend to be highly focused on what’s new. No matter how great your content is and how relevant it is — chances are, your readers will ignore it if they notice that it was published 3 years ago. Well, try bringing up one of your favorite blog posts from 3 years ago and highlight it on your homepage without changing its published date! Let’s see how much traffic you receive on that post.